When heat is applied to a junction of two dissimilar metals, an e.m.f. (thermo e.m.f.) is generated which causes current to flow from hot junction to cold junction. The thermo E.M.F. generated is proportional to the temperature difference between two junctions. Note: Larger the value of C2 larger is the nonlinearity in the thermocouple characteristics. types at higher temperatures 1) Temperature measurement of flammable materials/ fluids. 2) Since, they are chemically less responsive, used to measure temperatures of Acids and strong Bases. Strip 2: Platinum (100%) 0 to 1400 ± 1 0C 5 to 12 Most stable in all hazardous zones 1) Temperature measurement of flammable materials/ fluids. Since, they are chemically less responsive, used to measure temperatures of Acids and strong Bases. 0 to 1400 ± 1 0C 5 to 12 Stable in all hazardous zones 1) Temperature measurement of flammable materials/ fluids. The material of thermocouple must have high thermo E.M.F. per unit temperature change. The high melting point of the materials of the coupling materials for a wider range. The material should be pure, homogenous and workable in any shape. The material of thermocouple must be resistant to corrosion and must be usable over a long time without getting brittle. When a solid is heated, it increases in volume. The increase in the length of solid depends upon original length, temperature and thermal expansion of coefficient. It is the rate of heat flow per unit time in a homogeneous material under steady conditions per unit area per unit temperature gradient. In the last article we have seen some signal conditioning circuits for RTD. Today we are going to learn signal conditioning for thermistors. We know that thermistor is temperature measuring sensor made up of semiconducting material. The resistance of thermistor normally decreases as the temperature increases hence it is has negative temperature coefficient (NTC). The characteristics of thermistor resistance vs. temperature is non linear therefore linearization circuit is also included along with amplifier in the signal conditioning circuits for thermistor. Signal conditioning of thermistor includes bridge amplifier and linearization circuit. These circuits are explained as follows. Following circuit shows a bridge amplifier used for amplifying the output of thermistor. As the output range of thermistor is quite low and it not good to use such short range of output for getting good accuracy for operating any field devices. Bridge amplifier consist of wheatstone bridge in which inverting amplifier with thermistor as feedback resistor is used in one of the arm as shown in the diagram. This operational amplifier produces output voltage proportional to the change in the resistance of the thermistor. For linearization of thermistor characteristics there are several methods available. In this method a parallel resistor is connected with thermistor. This method increases linearity but also decreases the sensitivity of the circuit.
? is characteristic temperature constant. In this method a series resitance is used with thermistor. It reduces nonlinearity of conductance vs. temperature characteristics of thermistor. The third method for linearising the thermistor output is by using op amp. Following circuit shows the linearization circuit for thermistor. Here we have used a thermistor along with series resistor connected to the inverting terminal of the op amp. An adjustable supply voltage is used to adjust the gain of the amplifier. In this way we have seen different signal conditioning circuits for thermistor. Hi friends, today we will see how to linearize output of RTD. We know that Resistance Temprature Detector (RTD) is widely used temperature sensor. Sometimes we need a linearly changing sensor output for building any digital control system. For example if we have to control a fuel supply to the burner using the temperature reading of the RTD. We can not apply its output (i.e. non linear resistance) to a digital system for controlling the physical parameter. So the question arises how to linearize RTD output. We know that the output of normally used platinum (Pt100) RTD is non linear. The non linear change in resistance of RTD with respect to temperature is given by the quadratic equation which includes a non linear term. Following circuit gives the output in the linear form. In the circuit, we have used RTD resistance as a feedback resistance of op amp. In this way we can easily convert nonlinear output of RTD in the linear form. Above circuit is best suited for the temperature range of 0 to 500 degree Celsius. We know that signal conditioning is a process in which signals from different sensors are transferred into a form necessary to interface with other modules of system. For example, we know that thermocouple produces very low output voltage and this voltage is not sufficient to operate the other controlling modules. Therefore there is need to amplify such signals. For this purpose we use different signal conditioning circuits. In case of thermocouple, we have to use amplifier, linearization circuits, etc. the purpose of using linearization circuits is that, thermocouple has non linear characteristics but in most of the cases we need linear controlling action. There are different types of signal conditioning operations such as amplification, filtering, isolation, linearization, excitation, etc. we will discuss all these operation one by one. We know that most of the sensors produce output in the form of change in resistance, voltage or current. All these parameters are having very low strength i.e. very small voltage in case of thermocouple, small change in resistance in case of RTD, etc. Therefore we have use current or voltage amplifiers in case of sensors which produces output in the form of current or voltage. If the sensor produces output in the form of change in resistance (such as resistance thermometer) we have to use bridge amplifiers. We can make use of operational amplifiers to amplify the signal. Another important signal conditioning circuit is filter. As mentioned earlier most of the sensor produces very low output and therefore electromagnetic noise may get added in the original output. To remove the electromagnetic noise from sensor output we have to use different filter circuits. Filter circuits eliminates noise i.e. undesired frequency components from original signal without affecting it. Active filters, passive filters, bypass filters are the common types of filter circuits. Isolation circuits are required to differentiate signals from unwanted common mode voltages. Another advantage of isolation circuit is that, it protects measuring devices (sensors) if high voltage is applied to other circuit. It also breaks ground loops. There are many sensors which produces non linear output such as thermocouple, thermistor, etc. linearization circuits are used to convert non linear signal into linear one. It can be achieved by varying the gain of an amplifier as a function of input signal. Another signal conditioning operation is current or voltage excitation. Signal conditioning circuits provide the required voltage or current excitation to some passive sensors such as strain gauge, RTD, etc. In the upcoming posts we will see signal conditioning of RTD, thermistor and thermocouple. 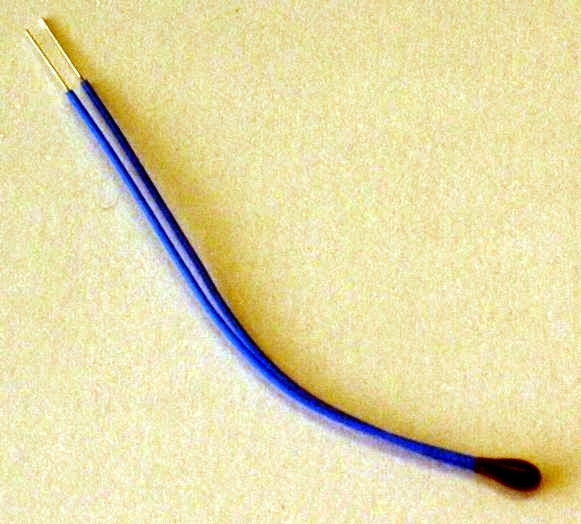 This section provides you a detailed steps to determine the characteristics of thermistor. Aim: To determine the characteristics of thermistor (resistance temperature characteristics). Apparatus required: Bead type thermistor, multimeter, thermometer, water bath, heater connecting wires, etc. Thermistors are the temperature sensitive resistors that exhibit a negative temperature coefficient of resistance. In other words electrical resistance of a thermometer will be reduced when it is placed in an environment of higher temperature likewise its temperature decreases. thus the characteristics of thermistor provides an information about how its resistance changes with the changes in temperature. It is very essential in temperature measurement, thermistors are manufactured and formed into rods, discs, and washes, beads for special applications, they can be directly or indirectly heated. Temperature determines the resistance of those that are directly heated in environment. The resistance of indirectly heated thermistor is determined by temperature of self-contained heater. Following are the steps to determine the characteristics of thermistor. 1) Take water in container and place a heater to heat water. 2) Immerse thermistor and thermometer in water bath. 3) Switch on the power supply. 4) Measure the temperature on the thermometer from room temperature (30 C) to 98 C and corresponding resistance of thermistor at that temperature. 5) Switch off the power supply, and then take reading in decreasing order of temperature in an interval of 10 C.
6) Plot a graph of temperature on X-axis and Resistance on Y-axis. 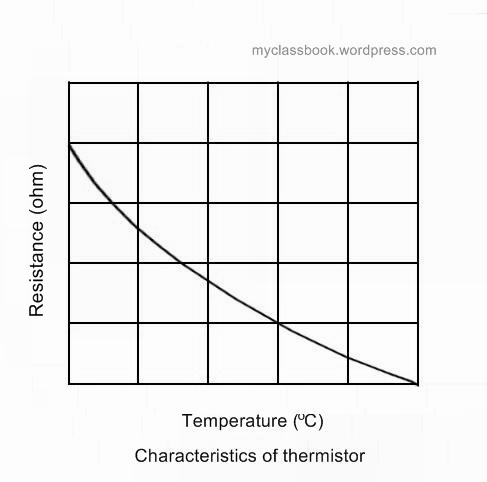 This graph shows the characteristics of thermistor. By taking following readings we can plot the characteristics of thermistor on a graph paper. We have To= 30 C, Ro=980?, ß=4000. 1) Input and output relationship is non-linear for thermistor (i.e. characteristics of thermistor are non-linear). 2) In comparison with RTD change in resistance for a given change in temperature is very large. 1) What is negative temperature coefficient of resistance ? Answer: The property of a material in which resistance of a material decreases with increase in temperature that material is said to have negative temperature coefficient of resistance. 2) What are common shapes of most commercially available thermistors. Answer: The common shapes are bead type, disc type, rod type ans IC chips. 3) What the difference between directly heated and indirectly heated thermistor? Answer: In directly heated thermistor, there is direct contact between source and thermistor, but in indirectly heated thermistor there is no direct between source and thermistor. 4) What is the relationship between thermistor resistance and temperature? Answer: In thermistor, resistance is inversely proportional to the temperature. 5) What is the range of temperature for thermistor? A device detecting the presence of parameter or measured variable and converting it into suitable form is called a sensor. It is a device which converts one physical parameter into other. It is information receiving device, in a form of quantity. It converts the information in the same or other quantity, for indication, recording or control. The device used for conversion of a non electrical quantity into electrical quantity is called transducer. A transducer is a device which converts non-electrical or physical quantity into electrical quantity. In most of the electrical system the output is not in the form of electrical form, but in non-electrical form. So if we want to measure that output using electrical methods we are required to use transducers. Transduction means conversion of input information, into some suitable form. E.g. Glass. Thermometer is a sensor as it converts temperature into displacement of mercury column (non-electrical) and thermistor is a transducer as it converts temperature into resistance change (electrical). Sensing element senses the physical or non-electrical quantity like temperature, pressure, etc. or its rate of change. The output of the sensing element goes to the transduction element. This transduction element is responsible for conversion of non-electrical or physical quantity into its equivalent electrical quantity. In some cases this transduction element performs both the action of sensing as well as transduction. For example if we consider thermocouple, it generates emf (electrical quantity) corresponding to the heat generated at the ends of two dissimilar metals.